The process can much more easily be executed by a team of problem solvers. This makes the approach scalable. Since the process is formally defined it can be continuously improved. Over time the process can evolve to be so powerful it's your most important asset, as it is for many of the world's largest companies like Toyota, Intel, and Exxon, and for all of science via the Scientific Method. Process driven problem solving is the second of the three main tools in our toolkit for solving difficult social problems. 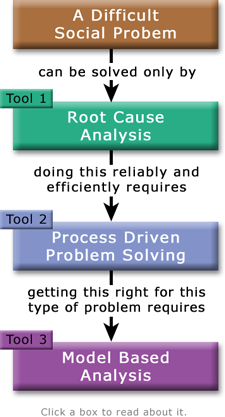 The diagram explains how doing a root cause analysis well requires process driven problem solving. 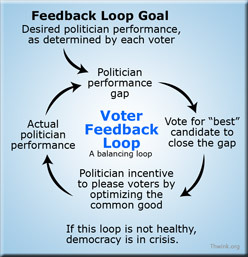 The process thus serves as a wrapper for the root cause analysis approach you wish to take. 2. Choose or develop a suitable process for solving this type of problem. 3. Execute the process, which must include continuous improvement. Activism is currently struggling in step 2. A process is a reusable series of steps to achieve a goal. 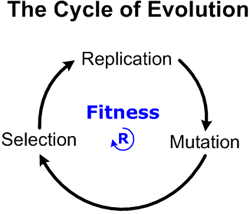 The most successful process in the world is the three step process of the evolutionary algorithm: replication, mutation, and survival of the fittest (selection). In only 3.5 billion years this process produced you and me. The real kicker is The Cycle of Evolution is random. It's not intelligent. Nature never asks "Given this situation, what would be a good mutation to try in the next cycle of replication?" But humans can ask that question. In fact, this website asks that question as directly as possible: "Given the sustainability problem, what would be a good approach to take in our next generation of solutions?" We've concluded the answer is the System Improvement Process. It's the heart of our approach. Principle 2. Create a continuous process flow to bring problems to the surface. Principle 3. Use “pull” systems to avoid overproduction. Principle 6. Standardized tasks and processes are the foundation for continuous improvement and employee empowerment. Principle 10. Develop exceptional people and teams who follow your company’s philosophy. Principle 12. Go and see for yourself to thoroughly understand the situation (genchi genbutsu). Principle 13. Make decisions slowly by consensus, thoroughly considering all options; implement decisions rapidly (nemawashi). Principle 14. Become a learning organization through relentless reflection (hansei) and continuous improvement (kaizen). Taken one at a time, the principles each make plenty of sense. But one could just as easily provide a different set of principles. So what makes these so special? Why do they work so well? Because they are the result of decades of continuous process improvement. They are integrated and self-reinforcing in hundreds of subtle ways that escape casual examination. 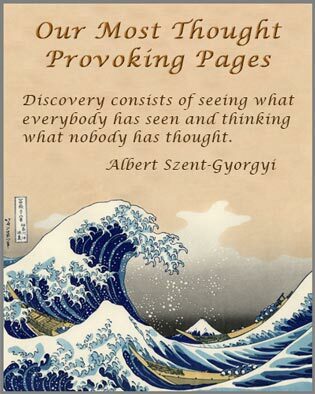 In other words, the power of the 14 Toyota Way Principles comes from emergent behavior. (1) Source: The Illustrated Art of War, by Sun Tzu, translated by Thomas Cleary, 1998, Strategic Assessments, item two. (2) The Toyota Way Principles may be read here, which offers a little more data for each principle. In 1996, based on our own experience and borrowing the best practices of our colleagues and partners, The Nature Conservancy developed a new approach to conservation, one that translated our broad mission into a more specific articulation of common purpose and direction. We call that framework Conservation by Design. Today, Conservation by Design is the foundation of all our work. It shows us where to work, what to conserve, what strategies we should use and how effective we have been. Over the past decade, we have learned a great deal by applying Conservation by Design. By stepping back and assessing biodiversity and threats over broad areas of land and water, we are better able to set priorities. By more systematically analyzing threats and their root causes, we can design more effective strategies.